Aerium Encore Scottsdale is a brand new luxury contemporary townhome community near Downtown Scottsdale built by Canadian home builder, Landmark Group. Aerium and Aerium Encore will be the home builder’s debut in the USA. They have plans for a 3rd project called Center 8 off Roosevelt St. in Downtown. 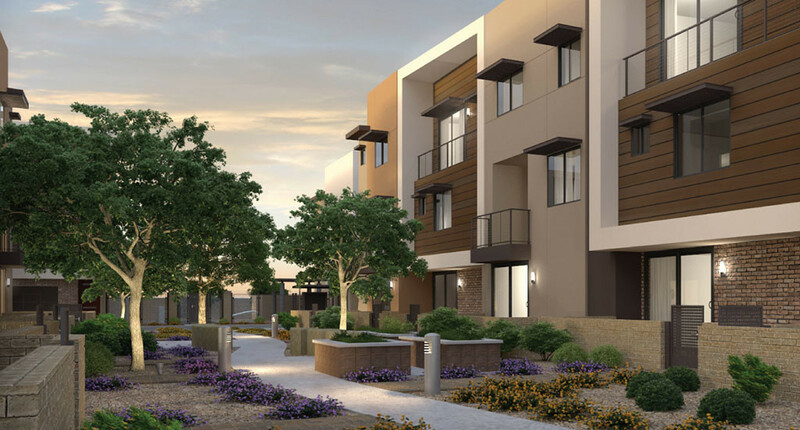 Aerium Encore Scottsdale has 27 townhomes available for purchase, just like the first phase, Aerium, 3 blocks North. There are 3 different 2-bedroom floor plan choices with an option for a 3rd and 4th bedroom. These townhomes are designed with either a 2-car side-by-side or 2-car tandem garage on the ground level along with an optional flex room. On the main level (2nd flor) will be the living & kitchen. All the bedrooms will be on the 3rd level. The community will have a sparkling lap pool along with an herb garden. Pricing starts from the low $400s. Inquire with us for more details. Aerium Encore Scottsdale is a brand new luxury contemporary townhome community near Downtown Scottsdale built by Canadian home builder, Landmark Group. Aerium and Aerium Encore will be the home builder's debut in the USA. They have plans for a 3rd project called Center 8 off Roosevelt St. in Downtown. Aerium Encore Scottsdale has 27 townhomes available for purchase, just like the first phase, Aerium, 3 blocks North. There are 3 different 2-bedroom floor plan choices with an option for a 3rd and 4th bedroom. These townhomes are designed with either a 2-car side-by-side or 2-car tandem garage on the ground level along with an optional flex room. On the main level (2nd floor) will be the living & kitchen. All the bedrooms will be on the 3rd level. The community will have a sparkling lap pool along with an herb garden. Pricing starts from the low $400s. Inquire with us for more details. Looking to sell a property at Aerium Encore?